What is Prothiaden (Dothiepin Hydrochloride) used for? Prothiaden (Dothiepin) is a tricyclic antidepressant prescribed to treat patients suffering from depression. It operates by balancing chemical levels in the brain to reduce feelings of guilt, worthlessness, anxiety, or irritability. This medication is especially effective when treating patients with trouble sleeping or intense anxiety. Your physician may also prescribe it to treat other unlisted conditions. How should I use Prothiaden (Dothiepin Hydrochloride)? 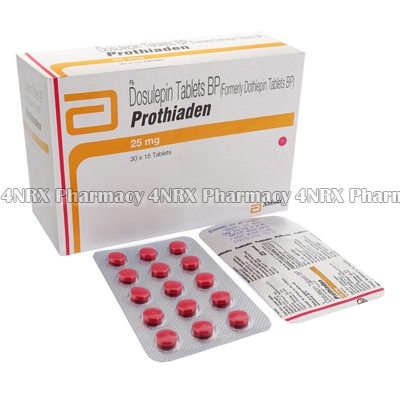 Prothiaden (Dothiepin) is normally taken once each day at a dosage of one tablet. Your individual dosage may differ and will be determined by your physician after observing your health condition and the severity of your symptoms. Swallow the doses whole with a large glass of water to aid absorption. They may be taken with or without food, but a snack or meal is recommended before use if you experience nausea. Do not change the form of the tablets prior to use to avoid destroying their contents or altering their effects. Ask your pharmacist or physician any questions you have about the medication to prevent unexpected health problems from occurring. What are the side effects of Prothiaden (Dothiepin Hydrochloride)? Immediately inform your physician if any symptoms become worrying or if more serious side effects appear such as urinary retention, hypotension, skin reactions, muscle tremors, confusion, unusual thoughts, disturbances in blood cell counts, seizures, irregular heartbeats, or faintness. These conditions may require emergency medical assistance or adjustments to your dosage to prevent further problems from occurring. Prothiaden (Dothiepin) should not be used to treat patients who have recently had a heart attack or have closed angle glaucoma, bipolar disorder, heart defects, arrhythmia, or if you have taken an MAOI medication in the last two weeks. It is also important to tell your physician if you have a history of epilepsy, hypothyroidism, hyperthyroidism, psychotic illness, bipolar disorder, porphyrias, heart disease, history of glaucoma, urinary retention, an enlarged prostate, or if you are currently undergoing electroconvulsive therapy as these conditions may require reduced dosages to prevent unexpected health problems from occurring. Strictly follow all instructions provided to you by your physician or pharmacist while using Prothiaden (Dothiepin). Optimum and safe dosage can differ based on the patient and the condition being treated.